When I started working at PINT, I had to adapt to using new technology in my daily tasks. Continue reading to explore some of the SaaS (Software as a Service) tools we leverage at PINT. Plus I’ll share the benefits of those technologies, and how I adapted to using them in my new role. PINT and the rest of the world are moving into an interesting time. The days of Manila folder files are pretty much gone. The way we work has to be further distinguished from paperless. We are now almost “locationless.” We work with SaaS tools in the cloud from almost anywhere. This offers some benefits to myself, as well as PINT. But before I tell you how great all these tools are, a disclaimer. All these benefits do come with a tradeoff. We give up a little bit of control and full possession of our data for ease of use and convenience. But with a rigorous data backup and storage policies, companies can mitigate the risks that come with SaaS tools. Companies need to make a firm decision on any sensitive information they will save to the cloud. For example, PINT’s payroll and HR data is hosted in a local environment and replicated at our secure payroll/HRIS provider. I was privy to G-Suite before working at PINT. But only used the most common options, Gmail and GCal. Both useful tools, but in my opinion, not as useful as Google Drive, the cloud-based document sharing solution. How does G-Suite Benefit PINT? 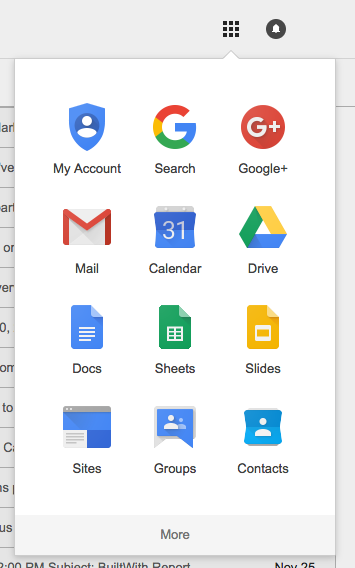 G-Suite makes user management and access to shared documents quick and easy. We can share one document with all members of the PINT team, and another with only a select few. We can access G-Suite on any device, so using our smartphones and tablets is an option. You can access data anywhere with internet connection. At my previous job, all client information was stored on a local server. It was only accessible outside of the network only if you had VPN access (which we didn’t). This made it difficult (if not impossible) to complete requests away from the office. Google Drive solves this. You can create, store, edit, and share important documents in the cloud with your desired audience. Plus, you can access those documents on any device where you have internet connection. You and your colleagues can collaborate and stay organized. I had to adjust to using Google Drive when I began working at PINT, as we use it for just about everything. We submit PTO requests with Google Forms. We even track participants for potluck events with Google Spreadsheets. This took some getting used to, as my inclination was to create a folder locally for every client. I quickly realized that Google Drive offers the same ability, just within a different interface. I now have a separate folder for each of our clients within my Google Drive that I can access anywhere. > Client request management is important to any company who supports such requests every day. Running a customer service department through a typical email interface is no match for SaaS tools. It is a recipe for lost requests, forgotten follow-ups, and poor documentation. Teamwork integrated with our time management software. Teamwork allows us to be completely transparent with our clients. We can give them access to tasks and files associated with their projects. I used a similar type of tool before working at PINT. So other than getting used to a new interface, the transition was smooth. I was already aware of the functionality and purpose of the Teamwork tool. We must accurately track what work should be invoiced, and have proper documentation to go along with that work. It is important to us for client retention and satisfaction. Of course, PINT has always been intent on building tools where it could not find them in the marketplace. A millennium ago, PINT recognized the need for a web-based time and task management system. When existing options didn’t fully meet our needs or exist, PINT built their own solution called the PINTranet. However, maintenance of a custom-built solution demands resources… resources that could better spent on client projects. Luckily for us, that tipping point arrived when better SaaS options entered the marketplace. That’s why today, PINT uses Harvest App to record time for client requests and projects. Communication is an integral part of the success of any team. At PINT, we use Slack’s messaging app to stay connected. There are several competitors to Slack who offer similar features. But we chose Slack because of its openness for integrations. At PINT we are able to integrate Slack with our task management program, so reminders pop up in our chat app. Similar notifications can be configured with a variety of programs and with IFTT recipes. Our more hands-on teammates even built a BathroomBot. It is a custom-built, Slack-IoT integration. It is triggered by a RESTful network of ESP8266 wifi chipsets. They send requests to a central server every time their mechanical door sensor is tripped. 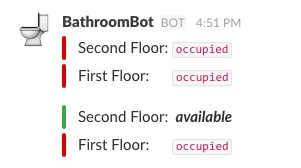 That way, we can use Slack to check if PINT’s two restrooms are available without walking outside to see. To ensure consistent communication with our clients, we use a couple of SaaS tools. Some of the information we provide our clients is basic web and tech updates. These require the use of an email management tool. At PINT, we use MailChimp as our email management solution. More specific information is sent directly from my PINT email. These emails are then logged into our CRM (client relationship management) tool. From there, they can be accessed by other members of the PINT team. At PINT, we use Nutshell as our CRM. There are many different options for this type of software. You may have heard of SalesForce, the big player within the CRM industry. Typically, the sales team uses a CRM to organize a sales pipeline and follow up on leads. My role requires me to use Nutshell as more of an account management tool, instead of a lead management tool. I use Nutshell’s option to add “tasks” to each account to ensure consistent contact with each client. Tasks are presented in a to-do list. They are reminders for me to follow up or connect with a client, either about a past initiative we discussed or to provide some new ideas. I send an email to a client about upcoming changes to Google’s Chrome browser. I want to make sure I follow up with that client on that information, so I set a task on that client’s account for a week in the future. Then I see a reminder when I’m logged into Nutshell come seven days from now. > Internal communication and collaboration are crucial pieces of a successful organization. These tools allow our team to stay connected with each other and our tasks. They also help us access important information from almost anywhere. SaaS tools have matured quite rapidly. However, most systems are quite similar to their on-premise alternatives. This makes the adjustment much more manageable than you might expect.